Today, we are excited to announce that ESL Pro League CS:GO is the first product to follow ESL’s brand refresh. Pro League does not only get a facelift, but also a new positioning that supports ESL’s overarching goal of creating a world where everybody can be somebody! After having announced the upgraded format and that all matches will be played on LAN as the first step, it is now time to also present Pro League’s new look and positioning. During our research phase we looked at various aspects of the ecosystem to define where Pro League should be positioned. One of them is you – the fans. We realized that fans who follow Pro League belong to the most devoted Counter-Strike fans out there. You tune in week after week to follow your favorite teams and players and you know all the ins and outs of the game. Whilst many of you are super excited about the growing popularity of esports, you also want to make sure it stays authentic and doesn’t turn complete mainstream. With ESL Pro League, we want to deliver this authentic Counter-Strike experience. In December we have already announced the upgrades to the product as part of Pro League’s new positioning. A league typically requires a bigger time investment than standalone events – not only for fans, but also for players. By changing the format from a big league to a system of groups of four teams, we not only make every moment matter to make it to the season finals, but also reduce teams’ time commitment in the league, allowing them to take more breaks in the busy calendar. The seedings of the groups are based on ESL’s World Ranking to make them as fair as possible. By also taking all matches in Europe and Americas into a LAN environment, the league becomes more competitive and delivers authentic matches and player reactions to CS fans around the globe! 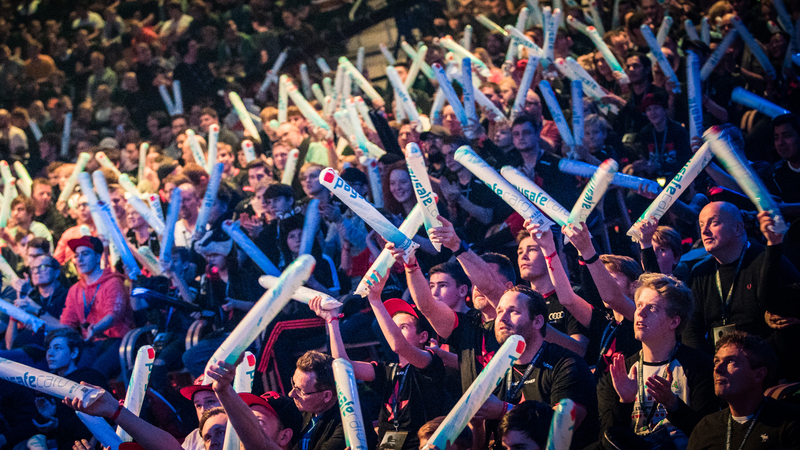 Visit the revamped official ESL Pro League CS:GO website to keep up with your favorite teams! The final piece to relaunching Pro League was updating its visual identity. Given that the teams are at the core of the league, the goal was to heavily promote the teams and their brands whilst falling in line with the new ESL masterbrand identity. Resulting from that, you get a 3D version of the new ESL camo, which changes its colors based on the team it represents. The camos clash with each other for matchups and stats comparisons. High intensity matchups – e.g. two teams being close to each other in the world rank indicted through the small numbers next to the team names – will create a bigger clash than less intense matches. The small splinters represent the grind, the intensity and power of those matches. In Pro League it’s not only about the winners, but also about the story of those who didn’t make it and the damage dealt with losses. We hope you are as excited for the new season as we are! Be sure to tune in when it starts on April 12th on twitch.tv/esl_csgo, youtube.com/eslcs and facebook.com/eslproleaguecsgo. For more information follow us on Instagram, Twitter and Facebook.